Just as wedding attire evolves to fit changing trends, so do decorations like centerpieces. Choosing a contemporary centerpiece rather than the same old bouquet in a glass vase, adds a modern element to any wedding. White branches look simply stunning when paired with a small floral ring at the top of the vase. If you want additional lighting at the tables without using candles, look for faux branches with LED lights at the ends. Adding feathers to your floral arrangements is a great way to add elegance to your wedding table decorations. Choose feathers in sophisticated black for a modern touch. Candles are a traditional centerpiece that can be easily updated for today's modern bride. Look for unique ways to display tea lights. Check candle and craft stores for contemporary vases and display options, like holders in the shape of floral blooms. Make a modern minimalist statement by using grass as your centerpiece. An overgrown look is perfect for a more rustic wedding, while trimming the tops is sophisticated. This is also a good option for a "green" wedding with earth-friendly elements. At modern weddings, virtually anything goes. If you have a bright or rainbow colored wedding scheme, don't be afraid to go crazy with your centerpieces. Most florists can dye blooms to fit any array of colors you can imagine. 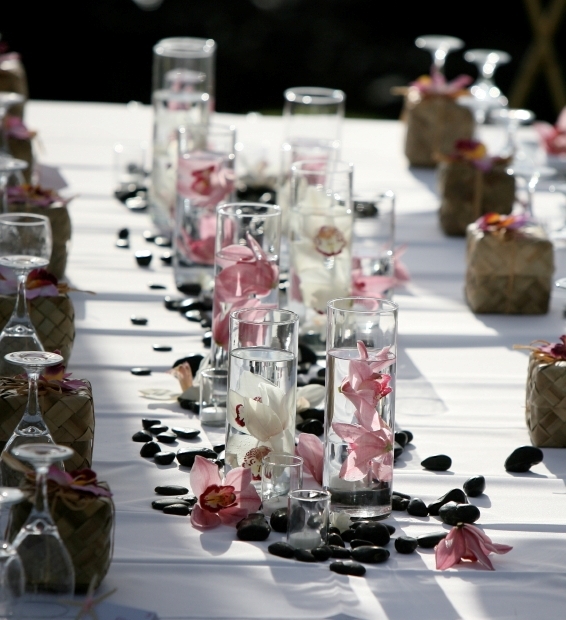 If you want a modern look without going to extremes, consider using square elements throughout your reception tables. Using square vases for arrangements alongside square tea light holders adds a hint of hip to otherwise traditional wedding decorations. Today's brides are all about saving money, so why not make your centerpiece do double duty? Arrange cookies, cake pops or rock candy sticks in a decorated container. Pick candies based on the season, your wedding colors or the holiday. Even after guests take their treats, the decorated containers will still look great on your tables. Colored water takes the traditional vase up a notch. Match the color to your wedding palette. Large branches with floral balls or topiary style tops add to the modern styling. Luxurious arrangements are perfect for an elegant upscale wedding. Varying heights of the floral stands add interest to this centerpiece, while beaded and crystal strands keep it contemporary.